View the latest status of the ozone layer over the Antarctic, with a focus on the ozone hole. Satellite instruments monitor the ozone layer, and we use their data to create the images that depict the amount of ozone. Click any map image to bring up a new page with a high-resolution image. Each year for the past few decades during the Southern Hemisphere spring, chemical reactions involving chlorine and bromine cause ozone in the southern polar region to be destroyed rapidly and severely. This depleted region is known as the “ozone hole”. The area of the ozone hole is determined from a map of total column ozone. It is calculated from the area on the Earth that is enclosed by a line with a constant value of 220 Dobson Units. 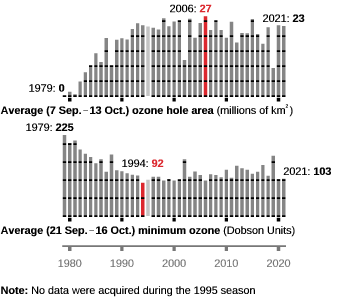 The value of 220 Dobson Units is chosen since total ozone values of less than 220 Dobson Units were not found in the historic observations over Antarctica prior to 1979. Also, from direct measurements over Antarctica, a column ozone level of less than 220 Dobson Units is a result of the ozone loss from chlorine and bromine compounds. The latest false-color view of total ozone over the Antarctic pole. The purple and blue colors are where there is the least ozone, and the yellows and reds are where there is more ozone. The graphs above show the progress of the ozone hole for 2018. The gray shading indicates the highest and lowest values measured since 1979. The red numbers are the maximum or minimum values. The stratospheric temperature and the amount of sunlight reaching the south polar region control the depth and size of the Antarctic ozone hole. The dashed line in the minimum temperature plot indicates the temperature below which Type I (NAT) PSCs can form. 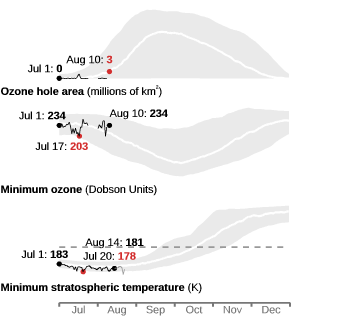 The data for the ozone hole area, the minimum ozone, and the minimum stratospheric temperature are available. Also available is a table of values showing the maximum ozone hole area and the minimum ozone values for each year. Click on the image to get a table of values. The graphs above show the variations of ozone from year to year. The red bars indicate the largest area and the lowest minimum value. The year-to-year fluctuations are superimposed on a trend extending over the last three decades.